The Pirates didn't have any waiting stars at AAA in late 1989, so manager Jim Leyand suggested looking to the low minors, according to The Pittsburgh Post-Gazette. One of those low minors pitchers he suggested: Steve Buckholz. "We've got some young arms in the system - Steve Buckholz, Keith Richardson," Leyland told The Post-Gazette. "We might take a look at some of them" in spring training. If the Pirates took a look at Buckholz that next spring, he didn't jump far. He spent the previous year partially at single-A Salem and returned there for 1990. Overall, he played five seasons as a pro. He never got a look at the majors. Buckholz' career began in 1988, taken by the Pirates in the fourth round of the draft out of Fresno State. At Fresno State, Buckholz pitched four innings of relief in a May 1988 game, without giving up a run. He started with the Pirates at short-season Watertown and single-A Salem. He went 2-2 as a reliever between them, with a 2.58 ERA and three saves. He returned to Salem and hit single-A Augusta in 1989 and served as a starter. He won league pitcher of the week honors in June. He went 15 innings over two outings, giving up six hits and no runs. 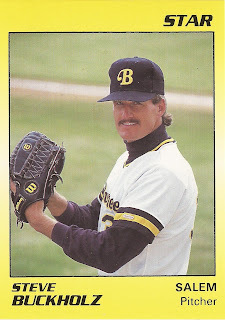 Buckholz hit Salem for all of 1990. He went 8-10, with a 6.01 ERA. He picked up an April win where he gave up two hits. He got his first 21-game look at AA in 1991 at Carolina. He went 7-10 there, with a 4.66 ERA. He returned to Carolina for 1992, where he posted a 7.38 ERA to end his career.